It’s here, a printed reel. Wha? Yes, you can buy a functioning, take it too the water and fish all day with a $75 3D printed reel. The innovative designer behind the first ever printed fly reel is Michael Hackney. His company is called The Eclectic Angler. You can buy a 3D printer for as little as an expensive Epson 13 X 19 color printer or as expensive as a commercial Epson printer at $8,000 or more. Hackney experimented with prototypes built on the same 3D printer that would print the finished product. Glue was the only compromise – it was needed get the strength. Outside of the adhesive, no other materials than the 3D printed ABS plastic constitute the final product. 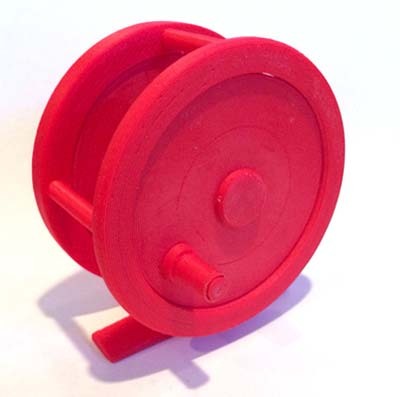 The goal was to print a working fly reel with no extra hardware requirements. 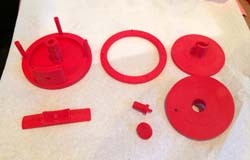 The finished reel has seven printed parts.